In the top of the safest and most reliable gambling markets in Europe, Sweden necessarily takes it place. Strict legislative framework and coordinated work of the state regulator with law enforcement agencies led to the fact that in the territory of this state in the north of Europe there are only four ground based casinos. All of them belong to the state company, which regularly replenishes the treasury with taxes. 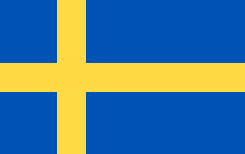 Swedish krona, svensk krona or Swedish kronor is the official currency of Sweden. Its digital code is 752, letter code – SEK, according to ISO standard. In one kroner there are the 100 öre. The central bank of Sweden Sveriges Riksbank issues kronas, which is under the control of the Riksdag. The kroner was officially announced as the national currency in 1873 instead of the Dalera. And ever since is used officially, even though the Euro Union requires the using of euros. The Swedish kroner rate in Sweden is determined by the results of currency trading. On the current day one US dollar =is equal to about 8 Swedish kronor. Gambling in Sweden appeared a long time ago. According to historians, the first mention of the “addiction” of predilection dates back to two hundred years. The first gambling house in the country was opened in the 18th century. It lured the players not only with rich furnishings and beautiful girls, but also with a wide assortment of games for that time. Gambler could play roulette, poker, basset (from the French “bassette”, an old gambling card game originally from France). In the development of the gambling industry, the church wedged in, calling it all a diabolical craft, after which the gambling business in Sweden fell under state ban with easy punishment for those who disobeyed. In 1897, in Sweden, lotteries were legalized. It took another 50 years to legalize other gambling as well, including bets and slot machines. The first gambling house that met all European standards was created in the country only in 1999. The law that controls the operation of the casino is still in force. In a sense, we can talk about the monopolization of gambling by the state. In the country there are officially only four gambling houses and all of them are the property of the state company Cosmopol. The first casino opened its doors to visitors in 2001 in the building of the old abandoned railway station, built in 1874. It became an excellent base for the gambling house. But we’re much more interested in online casinos. All mentioned above does not mean players who would like to make deposit in Swedish kroner must use international or just foreign online casinos, local online establishments can be found throughout the internet all the time. The thing is – how to choose the right one. In which casinos can you play with Swedish Kroner? Network segment of gambling is quite good in Sweden – the law does not prohibit the organization and conducting of gambling in the worldwide web. It should be noted that among all European countries Sweden got the most comfortable and safe laws that fully meet the needs of the country, business and every single citizen in particular. It helps people depositing their casino account in Swedish kronor without any exchange or additional fees. Sweden is for sure a good example of gambling-friendly country, that at the same time has strict laws. So, online gamblers who wants to play with Swedish kronor are fully protected. But there are several facts that you must know. Registration in the online casino with Swedish kroner is carried out in several stages, and it is mandatory to indicate in the application not only your personal data, but also the address of residence with the number of the banking cell. This is done so that the gambling house can check the available limits of the player (usually see the amount of money that the latter can comfortably spend a week), then it opens access to the games, or refuses to register. So before you start the registration or enter your credit card number, read the FAQ of the casino to find out if there are no limitations. And if you are not a citizen of Sweden, you better try international casinos that accept Swedish kronor, and not the local ones. All the information needed can be found after clicking on the casinos below, in the list. What are the methods of depositing in casinos with Swedish Kroner? A lot of Swedish casinos work internationally, providing its services to the citizens of other Scandinavian countries and several countries of Europe. And there are also some that work with countries like China, Russia and Brazil. It means, that usually you will not get problems with creating an account and depositing money to casino with SEK. Among most popular methods of payments in such casinos we can call credit cards, Skrill, Paypal, Trustly, Nordea and several other online wallets. Sweden is number one country in a world in terms of online payments, because only two percent of all payments in the country are carried out in cash. Therefore, the choice of payment methods in online casinos with Swedish kroner is usually huge. The rigid system of regulation of the gambling segment allowed Sweden to achieve stable replenishments of the state treasury and maximum security of users. And yes, one of the top developers of game software – the company NetEnt – is based in Sweden. Moreover, many network gambling houses were created there. It’s one of modern capitals of online gambling.